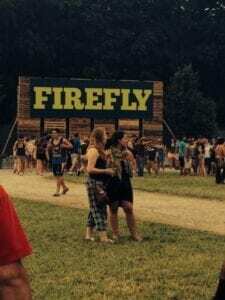 TNJN Social Media Coordinator Drew LaFasto tells about her experiences at the Firefly Music Festival. People gather at Firefly Music Festival to enjoy good music. People gather at Firefly Music Festival in front of a Firefly sign. 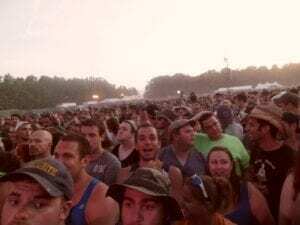 Sweltering sunshine and thousands of people roamed around Dover, Delaware for Firefly Music Festival. The temperature was probably around 191.6 degrees if you include the body temperature of a human and the temperature of the surrounding air. Concerned about dehydration, I made sure I had the right amount of water in my body. This was what I dealt with for the next four days. The heat was the least of my issues once inside the festival. Everyone was dressed as appropriately as we should all dress for the incalescence of the sun. Having arrived on Thursday, the first day of the festival, not many bands performed and so there was not much to see except the festival grounds. Notable performances included Kodaline, Local Natives and Amos Lee. Friday, my group of friends and I were finally well rested and ready for the day. We went to see the performance of the electro-pop Ghost Beach. They threw potted plants out into the audience to have the trees in those plants crowd-surf. My one friend wanted to see Sky Ferreira, but unfortunately she didn’t perform. Up next was Chance the Rapper, and the audience waiting for him was probably the most diverse group of people at the festival. Once he started rapping, everyone chimed in simultaneously. At that point, everyone connected to him singing and rapping. I’d continue experiencing this connectable phenomenon throughout the rest of the festival. Every crowd was different with each performance. There was Band of Horses, and later in the evening, White Denim. My friend and I stood at the front for White Denim and tried to dance as goofy as possible, in turn making the guitarist smile a little. 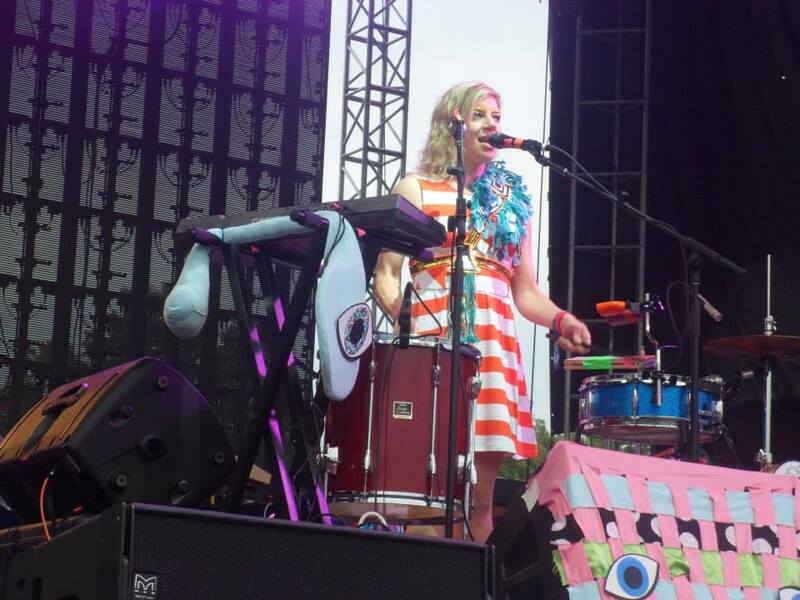 Merrill Garbus, vocalist of Tune-Yards, performed at Firefly. Saturday, I stood at the front of one stage for Lucius, Kaiser Chiefs, Tune-Yards and Beck. They were all excellent. Tune-Yards stood out the most because of their modesty on stage. They were thankful for the audience there, and they energized the audience with their dancing. Everyone danced with them. This was a new connection between the performers and the audience I hadn’t witnessed previously. Sunday, I almost died. Once again, standing at the second-to-front of the stage for about eight hours, red like a freshly picked hang nail (sunburnt), I enjoyed Weezer, Washed Out, Broken Bells and Childish Gambino. The festival had almost come to a close, with Childish Gambino as my last show. The audience grew larger. After the Broken Bells show, I couldn’t lift up my arms or move. Once Gambino jumped out onto stage, everyone propelled forward. Everyone was jumping and so was I. Not voluntarily, my feet were above the ground. I stuck to everyone’s bodies. Two security guards had to pull me out. One commented, “Wow, you’re really stuck!” That’s what you get for being a toothpick at a Childish Gambino stand-up concert. It was by far the most forceful crowd I had ever been a part of, but I’d definitely go do it again. Drew LaFasto is a junior at UT. She is the social media coordinator for TNJN. Drew LaFasto manages the Tennessee Journalist Facebook page and contributes articles for the news website. 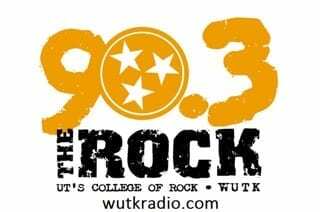 She is a senior in journalism at the University of Tennessee and works as a video editor at WBIR. With a broadened scope of passions within the realm of journalism, LaFasto enjoys all media formats as well as combining them. When she isn’t at work or at school, she is most likely playing video games, looking at weather maps or making art. She aspires to become a meteorologist at a news station or the National Weather Service.